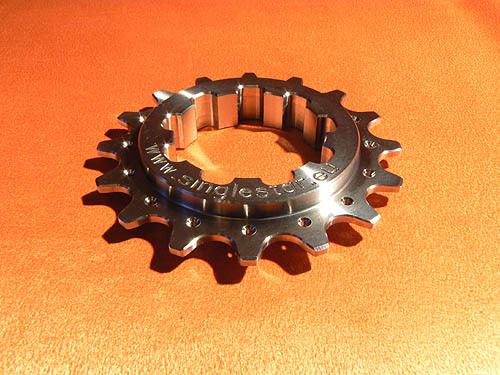 Thinking about picking up a Ti SS cog from the German co singlestar.de ... Anyone ever done business with these guys in the past ? Very nice cogs! I wants me one for the Haro and my steel Land Shark. I'd say just get a kit from Jenson. Save money that way. If the teeth wear out in a year or so, cheap to replace the cog. holy cow, at the current exchange rate, those Ti cogs are US$172! and that's before international shipping. they also sell titanium cog spacers for 8 Euros. why do they have to be titanium? you can get shiny aluminum spacers for <$1/ea from the LBS that are much lighter. keep your money in the States and get a titanium cog from ISAR/Homebrewed. or grab a ti cog from isuckatriding... not quite as wide base. IMO, the wide base (10mm) is a detriment. If you need an usual chain line, it can work against you. The 4mm-5mm on most high quality cogs is more than sufficient to distribute torque along the shall and thus thwart the dreaded notching. Other than that, it is a beautiful cog. (Although, ISAR is less bulky and more elegant looking). ISAR and HBC are one in the same. He has a long leed time so take that into account but supposed to be top notch and you can get almost 2 for the price of one.